Embroidered ugly tacky Christmas cardigan! 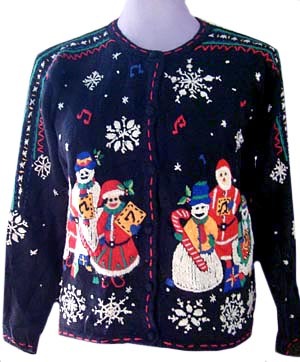 Black background with white, red, green, blue, yellow carolers and snowmen, and even SANTA is joining in!! Snowflakes and music notes surround the glorious singers. Colorful embroidery down the sleeves, ending in snowflakes (DUH!). Button-front. Snowman on the back! Tag reads Hampshire Studio. So bad it's good!! Marked womens large, will fit a men's Medium to Large, but check that length.